Gordon is the son of former MLB right handed pitcher Tom “Flash” Gordon and the brother of Los Angeles Dodgers shortstop Dee Gordon. Nick is a different athlete than both, with a long and slender 6-foot-2, 170-pound build that is just starting to mature physically, and a wide array of baseball and athletic tools. 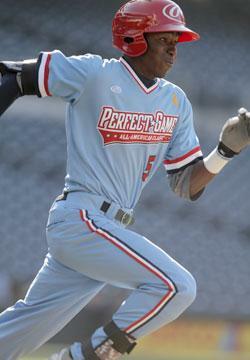 He ran a 6.68 and threw an amazingly easy 94 across the infield at the PG National. Gordon is possibly the top defensive player in the country, and he has been up to 94 mph on the mound with the Gordon family hard curveball.